For many, hot tubs are typically used as a source of therapy, relaxation and/or enjoyment. 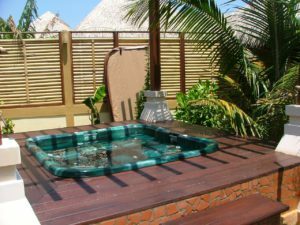 Although hot tubs do not require a lot of maintenance, there are key things one should know upon cleaning a hot tub cover. When’s the last time you’ve cleaned your hot tub cover? Last week? Last month? Last year? As time passes by, we tend to forget to keep up with the little things, such as this, because it’s not the top of our priority. However, in order for your hot tub to function properly, maintaining it is of the utmost importance. Hot tub covers are not cheap. In fact, they can cost some money. Taking care of your hot tub cover regularly should be implemented. By simply leaving your hot tub cover out in the open without cleaning it on a regular basis can grow mildew and mold. What’s worse than having bacteria on your cover? The smell. And no one wants that. Remove the hot tub cover off of the hot tub and move it to a place where you are able to clean it. Take out all of the debris, rocks, etc. from your hot tub that can possibly damage it. Spray down your hot tub cover with water to help remove any residue, dirt or debris that’s on it. Get a vinyl safe cleaning solution (or a hot tub cover specific solution) to help clean the cover. Clean the exterior, interior and in between the flaps of your cover thoroughly with the solution. Rinse off the interior part of your hot tub cover with water. Allow for your cover to air dry. *Repeat these steps every 90 days for the best result. Hot Tub Covers at Sunny’s! If you need any help with hot tub maintenance or repair, we are more than willing to help. We at Sunny’s want you to enjoy your hot tub experience to the fullest, so please let us assist in that experience. For additional information regarding our hot tubs, contact us today. We look forward to hearing from you.